A couple of months before Salute may not be the time for this, but why do wargamers focus so much on how it all looks on the table? We’re as guilty as anyone else at our group in Frome, and it’s the same at the Huntingdonshire Wargamers too. Big miniatures, so the paint job looks good. Big scenery, so that it looks pretty. Notwithstanding that the scale of both is all wrong. 15mm figures with a typical wargame tabletop game are outlandishly large. For tanks, depths of the units are huge, even if the frontage is correct, because that’s how the models have to be. Houses and trees are gargantuan size. For Mission Command, we have a ground scale of 1mm:2m, so narrow roads are 60m wide and our narrow streams are like the Rhine in flood. 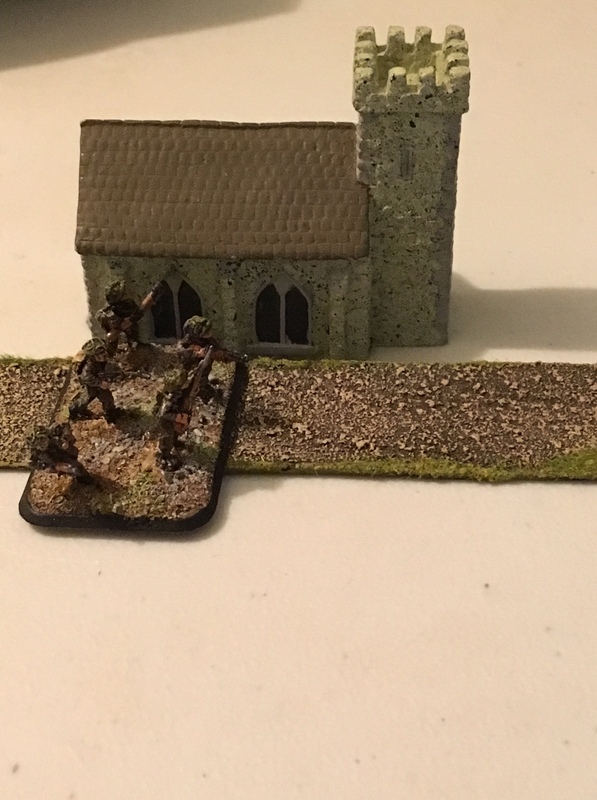 I’ve recently decided, on grounds of cost, to switch to 6mm for some of my Mission Command stuff (not Frome, because we’re committed to 15mm there). I’ve been surprised that the problem still exists here. The figures and models are better scaled, but the scenery is still massively oversized. 6mm roads are commonly 2 to 5cm in width. Just doing the maths: a popular brand has the narrowest road (called a “narrow dirt road”) with a width of 2cm plus a further 1cm of verges. The widest is the “medium [sic] metalled road” at 3.5cm plus 1 cm of verges. As 6mm is 1/300 scale, these translate to 6m carriageway for the narrow dirt road and a whopping 10.5m for the medium metalled road. Bearing in mind that modern lane widths are approximately 3.5m to 3.75m for major roads, making 7m to 7.5m for a standard 2-lane highway (an A road in the UK), these scaled versions are 50% to 100% too wide. Probably more in fact, because WW2 roads (and more so in earlier periods) were not as wide as modern highways. Just checking my own reality, the B1040 outside my house (a 2 lane medium metalled road) is less than 6m across – at a pinch this could be represented by a 2cm wide piece. But this is not a narrow dirt road. Oversized terrain in 15mm. The road is supposed to be a narrow road, but the infantry element has a frontage of 100 metres. Also the men will have trouble getting into that church, which is far too small for these figures, though it is about 150 metres long (Notre Dame is 128m long for comparison). 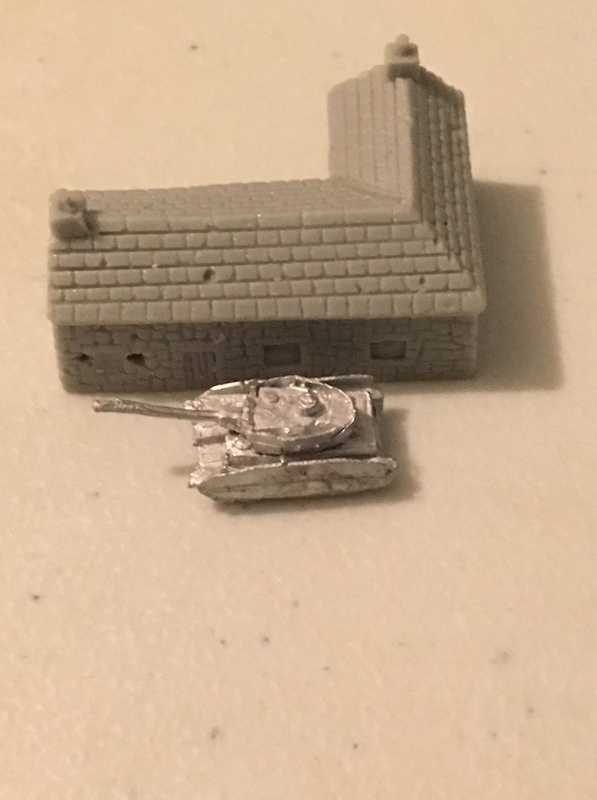 Other scenery in 6mm is not much better from many manufacturers. One leading company I investigated advertised 6mm scenery, but the size was effectively correct for 15mm figures, not 6mm. Why is this a design problem? In my view, it heavily distorts the wargamers’ perception of scale when playing the game. There’s a tendency to assume a tank model represents a single tank or a single figure represents a single soldier – even if we know, intellectually, that the model represents more than one thing (unless it’s a skirmish game with 1:1 representation). So, shooting at a tank model might “knock out” the tank; but it may represent more than 1 vehicle, so you haven’t actually KOed all those tanks. Similarly, eliminating an element doesn’t represent causing all those guys to be casualties – some may have been killed, some wounded, maybe some captured, but many will have run off, helped the wounded back to safety, got lost, and so on. In fact, looking at tank losses during large engagements – Goodwood springs to mind, as I’ve been delving extensively into Normandy campaign materials – it’s clear that a tank unit can be rendered entirely combat ineffective without having all its tanks destroyed. When 1 of our tank models in Mission Command, representing say 4 vehicles, is removed, this might mean that 1 tank was burnt out, another was seriously damaged (maybe requiring 3rd line workshop repairs out of theatre), another maybe was repairable within 24 hours, and another was pretty much fine, except the crew bailed out, or it made tracks away from the scene. In a later loss report, these might go down as 1 or 2 losses only, depending on how that army recorded such events. That road on the tabletop also skews our perception of distance. The position in front of my troops can’t be very far, because this (overly wide) road my guys are on is only a foot or so away from it! But a foot may not be close at all – with Mission Command, a foot on the table represents about 600 metres on real ground, and in Normandy an advance of 600 metres could take 3 hours of intense fighting, or even more in the bocage. For an appreciation of what our toy soldiers are doing, if we’re reflecting reality, we need to be aware of the distortions of scale that our “pretty modelling” portrays. Rather better 6mm terrain. That single storey farm is about right against this Panzer IV.